One of my big goals for this summer is to rest and recharge. I had a very full and blessed last eight months, but my mind and body are ready for some quiet, calm, simple days at home. 1. Read three chapters of to the children. Read two chapters of with Kathrynne, read two chapters of with Kaitlynn, read a few picture books with Silas. 2. Attend the homeschool conference here and buy our homeschool curriculum for next year. 3. Go to the circus as a family. 6. Read , , , and . 8. Finish the Clutter-Busting Challenge. 9. Work on my embroidery project for at least 30 minutes. 1. Read three chapters of to the children. Read three chapters of with Kathrynne, read three chapters of with Kaitlynn, read a few picture books with Silas. 3. Memorize Romans 1:15. Review Romans 1:1-14. 5. Read , , and . 6. Get at least 7.5 to 9 hours of sleep every night. 7. Finish planning our summer schedule. 8. Finish tweaking recipes for the new recipes page. Thanks Crystal for hosting the link up! I was glad to hear you have been able to get more sleep, that is something I have been trying to be more intentional about, but with a 2 month old it is a little tricky. I know though that getting to bed earlier would help for those nights he likes to be up. Thanks for the encouragement in goal setting! Last week went a bit better for me, er, except for all my health/fitness goals, which were a major bust. Sigh. But I will try again. 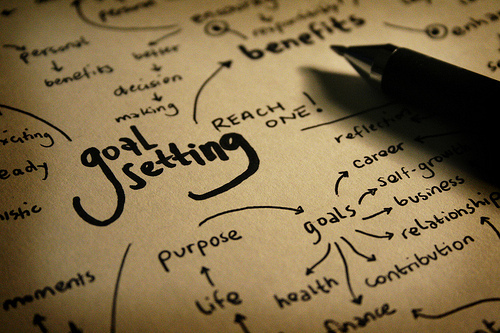 I really like the idea of setting goals that will encourage rest and recharging. I’m a big to-do list person, so I will make myself crying trying to cross everything off my list. What I need to do is add less to my list! Today, for example, my one and only goal is potty training my 2 year old. Might be tomorrow’s and Wednesday’s goal, too. 🙂 Thankfully dinner tonight is thawing in the fridge! I’m hoping you have great success with potty-training! That’s a big goal! I too have cut back on the amount of goals for each week. As we are transitioning into a busy time for our gardening I need to cut back on a few other things. I am only taking on 5-8 goals a week just to keep my week more manageable. I need to start going to be a little earlier although it is not one of my goals this week. Reading your goals reminded me I need to make more of an effort to get to bed on time. I have been consistent with getting up each day but I need to get to bed before 11 pm. I do so much better when I have enough sleep. Look forward to a fun summer and simplified goals. Nice though to keep pressing on with some minimal goals. Thankful for summer time and we will all have a great time, lets savor our moments with our family this summer! My son loved the Trumpet of the Swan. He had me read it to him twice! I’ve been slacking on getting enough rest too, and finally added it to my goals list. I miss the Early to Rise Challenge! Amazing how much reading I’ve done since adding it to my weekly goals. Thanks so much for hosting this link-up. I am excited about summer. But will have to remember not to overshoot and do too much! It seems like we get busier in summer than during the school year! I love reading your goals. You are an inspiration to me. Now that my 9 month old is mostly sleeping through the night, my main goal is start focusing on my sleep again too. I have been so unfocused and scattered lately and I know making my sleep more of a priority will help. It’s amazing the difference a good night’s sleep makes! I think it’s a great thing to slow down in the summer! I’m going to be doing the same thing myself. Good for you!! We all need to regroup and recharge occasionally. I never really got around to writing down my goals, but one them has been to go to the gym early in the morning so I can be done with my workout for the day. I’ve struggled with this for months because I am not a morning person, at all. I finally decided to stop making excuses and started last week. I’ve been able to go to the gym at 5:30am, 3 times now! I am so excited and really think I can keep it up. I hope that by getting into this routine I can continue it during the winter, even when it’s dark and freezing cold outside. Thank you for always inspiring us. I’m so glad you’re going to be able to slow down this summer. We are really focused from Sept until mid May with homeschooling and extra curricular activities. We all look forward to the summer to have some down time. I find it really hard to stay at that intensity all the time. I need time to putter around. Enjoy your time “off”. I love reading your goals. I need to be more consistent with my goals especially with doing educational reading and teaching with the kids. For your scriptures, why do you choose the ones you choose? Are you going by a book? I have written out weekly goals before and never had much success. I think I was trying to compartmentalize things too much. This week, I chose 10 things that I really wanted to improve and work on those. Much better results.